In a blog post heard ’round the oral history world, Zachary Schrag broke the news that the Federal Policy for the Protection of Human Subjects was finally amended to deregulate oral history. This new regulation, the result of decades of work by a determined group of scholars, is as exciting as it is complicated, so today on the blog we’re offering a meta-summary of some reflections on this change. A post on the Oral History Association’s blog succinctly clarified the rule change. The most critical component of the new protocols for oral historians explicitly removes oral history and journalism from the regulations…The new protocols will take effect on January 19, 2018. Schrag’s blog post offered a detailed explanation of the technical language, and the differences between the early Notice of Proposed Rulemaking (NPRM) and the final regulation. The final rule preserves and clarifies the NPRM’s deregulation of oral history. This is a great victory for freedom of speech and for historical research. The post went on to explain the reasoning, and another post on the blog details the consequences of the change for social scientists. The National Coalition for History weighed in with some background on both the change and the contentious relationship between historians and IRB procedures. 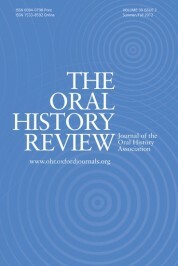 The growing inclusion of oral history under IRB review began an often contentious, confusing, and chaotic process. Was oral history—or historical studies more generally—the type of “generalizable” research covered by the Common Rule? The post drew on an article written by Linda Shopes that clarified the process and what was at stake before the rule had passed. Finally, Mary Marshall Clark, Director of the Columbia Center for Oral History Research, offered some perspective for the change, focusing on the motivation driving those who sought it. The technical arguments we made will not stand out in the historical record; the spirit that actually motivated so many arguments regarding the application of the policy was our resolute determination to remind the board that oral history is part of protecting the right to free speech and free inquiry. In that sense, we were not thinking of protecting narrators as potential victims, but protecting their right to speak freely and openly as citizens and agents in a democracy that guarantees free speech. While the change will not take effect until 2018, we are excited at the opportunities this change will create for recording and preserving the voices of people who might otherwise be denied a space to speak. We welcome additional analysis, summaries, and guides, so please add to this collection in the comments below or on Twitter, Facebook, Tumblr, or Google+. Featured image: “Liberty” by Mobilus In Mobili, CC BY 2.0 via Flickr. Andrew Shaffer is the Social Media Coordinator/Editorial Assistant at The Oral History Review and a Ph.D. student in History at the University of Wisconsin – Madison.